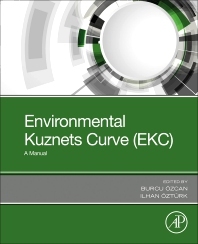 Environmental Kuznets Curve (EKC): A Manual provides a comprehensive summary of the EKC, summarizing work on this economic tool that can analyze environmental pollution problems. By enabling users to reconcile environmental and economic development policies, Environmental Kuznets Curve studies lend themselves to the investigation of the energy-growth and finance-energy nexus. The book obviates a dependence on outmoded tools, such as carrying capacity, externalities, ecosystem valuation and cost benefit analysis, while also encouraging flexible approaches to a variety of challenges. Dr. Ilhan Öztürk is Professor of Economics at Cag University, Mersin, Turkey, where he is also the Director of the Higher Vocational School. His research interests include energy economics and international economics. He has published more than 155papers in international journals such as Energy Economics, Energy Policy, Applied Energy, Renewable and Sustainable Energy Reviews, Ecological Indicators, Energy and etc. and participated in many international conferences. He has been invited as a Keynote Speaker in several international conferences. He is the editor of IJEEP and IJEFI and he has been member of editorial board in many international journals.